Cleveland-based baroque orchestra Apollo's Fire won its first Grammy Award Sunday. 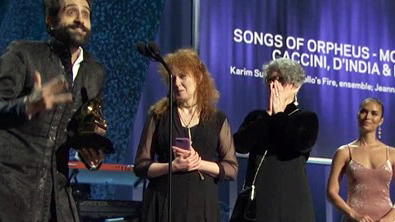 The group shares the win for “Best Classical Solo Vocal Album” with tenor Karim Sulayman. Apollo's Fire Director Jeannette Sorrell almost could not make it to the ceremony in Los Angeles, but she sure is glad she did. The award-winning album “Songs of Orpheus” focuses on the mythological figure who follows his beloved to the gates of hell to try to bring her back. It is about “love, and losing your love, and how you deal with that,” Sorrell said. Apollo’s Fire and Sulayman performed the program locally for a live audience once before recording it at St. Paul’s Episcopal Church in Cleveland Heights. Erica Brenner of Shaker Heights produced the album. The Recording Academy announced this award before the televised portion of the 61st Grammy Awards. Sorrell left Los Angeles Monday to travel to Omaha to play a chamber music concert. Apollo’s Fire resumes local performances Thursday at the Music Box Supper Club in Cleveland.